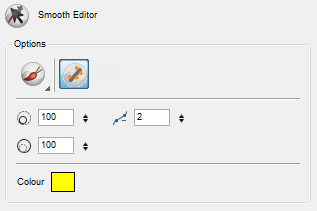 When you select the Smooth Editor tool, its properties and options appear in the Tool Properties view. The Smoothing Style options allows you to smooth a portion of your drawing either by tracing a smoothing stroke over the zone to optimize or by selecting an area of the drawing with the Marquee or the Lasso. The Show Control Points option allows you to show or hide the Bezier points around your lines. When the Bezier points are displayed, you can see the result of your smoothing and the number of points left on your curve. When it is turned off, you will only see the original artwork. 1. Minimum Size field: Type a value in this field to set the minimum width of the line. 2. Maximum Size field: Type a value in this field to set the maximum width of the line. 3. Up/Down arrows: Use the up and down arrows to set the minimum size value. 4. Up/Down arrows: Use the up and down arrows to set the maximum size value. This options is available while using the Brush Smoothing style. 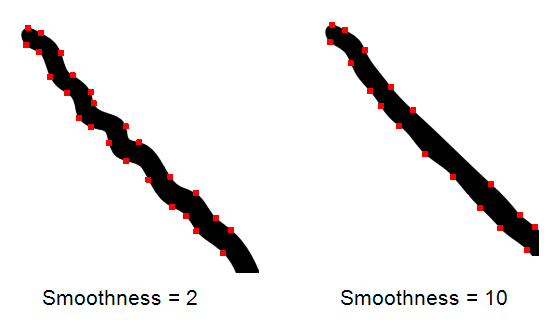 The Smoothness impacts the strength of the smoothing result. The higher the value, the more points are removed and the smoother the curve is. 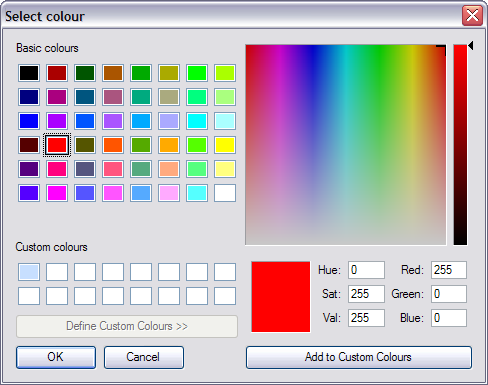 You can modify the colour of the control points displayed on the artwork while working with the Smooth Editor tool by double-clicking on the colour swatch.